Hello lovely creatives! My name is Stephanie Low and I am a lucky designer for Spellbinders! 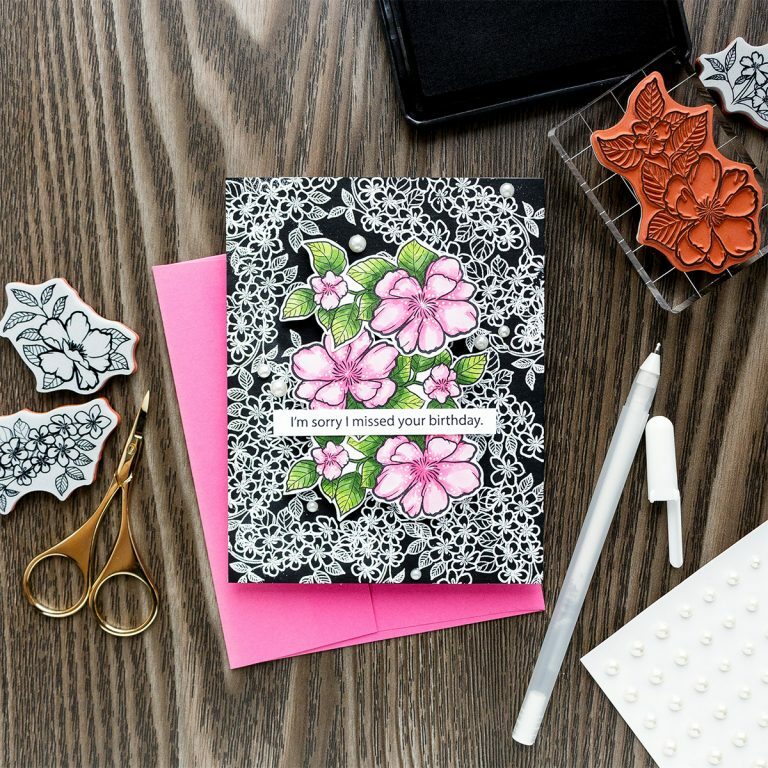 I created this floral collection last year with the hopes of seeing it colored, painted, collaged, and crafted in many ways. 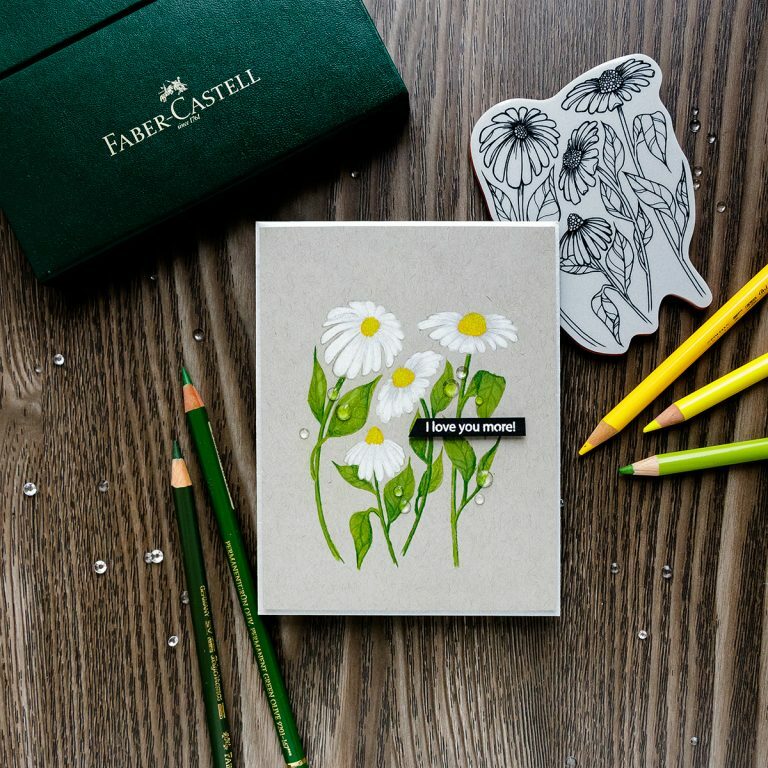 Many of these flowers were drawn from botanical photographs and others were modeled after a more exaggerated tattoo style. 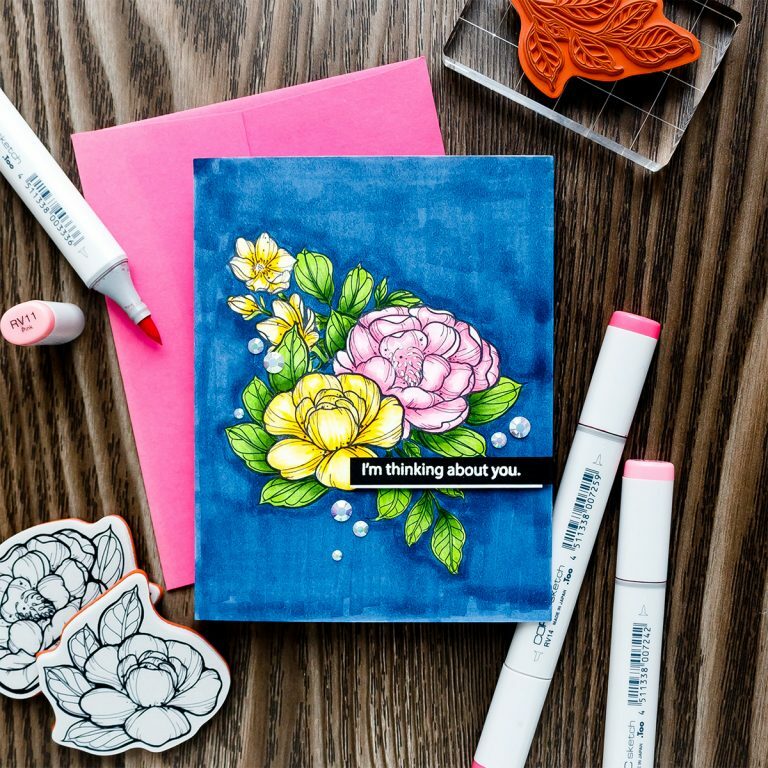 These stamps are designed to be built onto one another like arranging a bouquet. 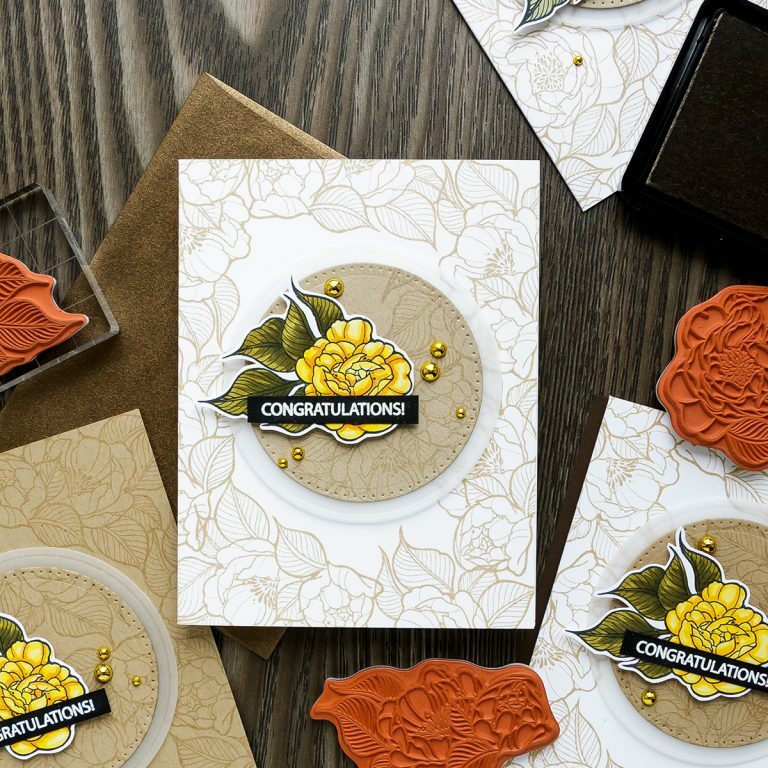 Stamp and color and then die cut them as usual, and then stack, style and arrange them together into little bouquet clusters for a cool layered look. I also loved making a background pattern by stamping them repeatedly on a single sheet of paper to make a personalized image. I used a lot of peonies because I think they are the prettiest and most majestic blooms. They are so fluffy and open and perfect for coloring. Mandala Bouquet: I love this image a lot because I designed it for a customer who wanted a mandala and a bouquet of large blooms. This is what I imagined. Often mandala art is comprised of geometric linework and paisley or henna styles, but I think nature inspired mandalas are just the best! 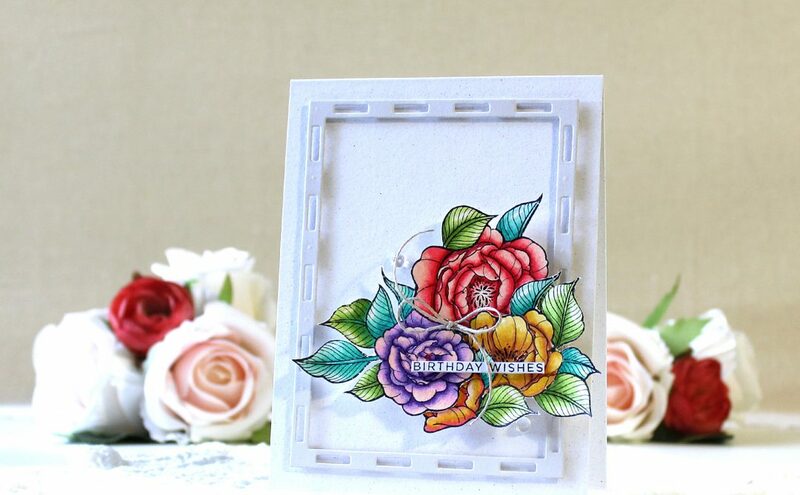 Peonies Blossoms: This set is very versatile. 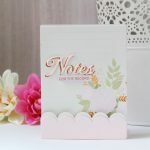 Timeless and classic and perfect for assembling little paper card bouquets! 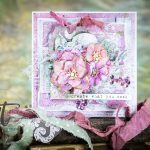 Peonies Bundle: These flowers were illustrated from a photograph I came across of a whole bundle of peonies. I took the cutest cluster and drew it up. I imagine them in pastels and splattered with paint and glitter! They are so delicate and fluffy. Mandala Blossoms: Similar to the Mandala Bouquet but this time with a more traditional stipled and geometric mandala. I actually recently stamped this mandala on some fabric and made an embroidering template out of it. It was a fun experiment and worked like a charm. Botanical Feather: This feather was also an image I made for a tattoo customer of mine. 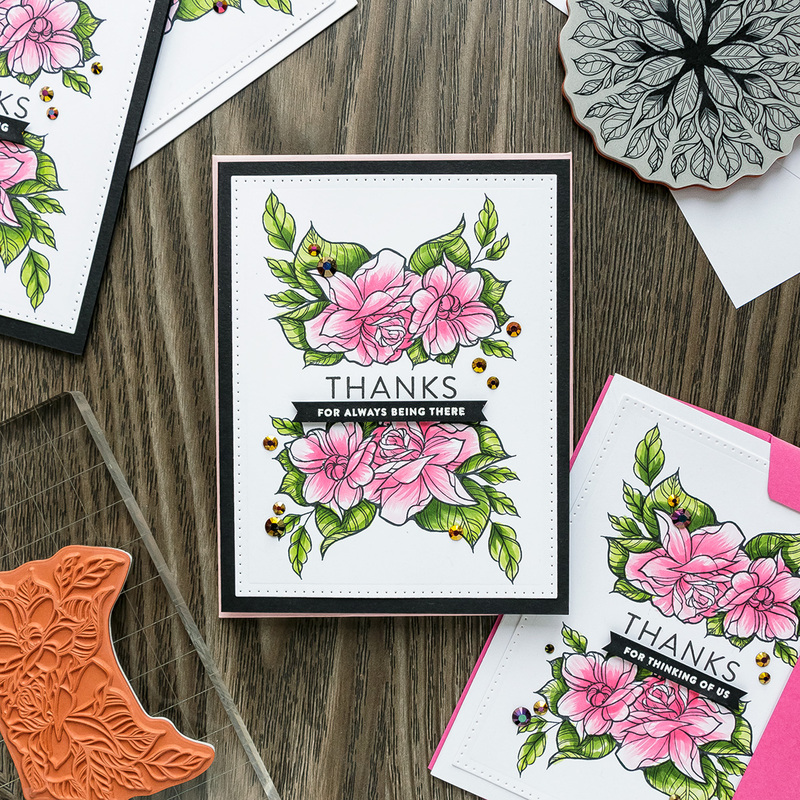 For the stamp set we decided to deconstruct it so that you as a crafter and artist can reassemble and use you wish. 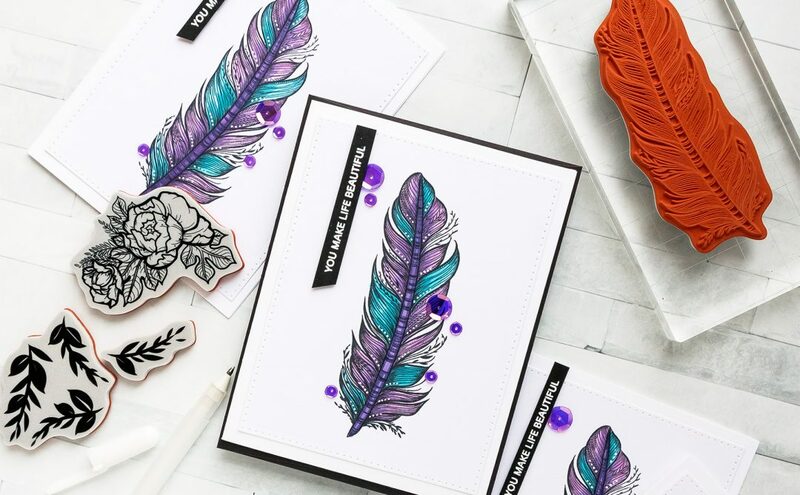 She can be stamped separately as a single feather or you can layer the florals and vines on top of inside of and around her. Endless possibilities. Chrysanthemum Cutie: Chrysanthemums are one of my favorite flowers. I love to say their name, I love to type their name, I love to draw all their little frilly petals! Isn’t she so cute! 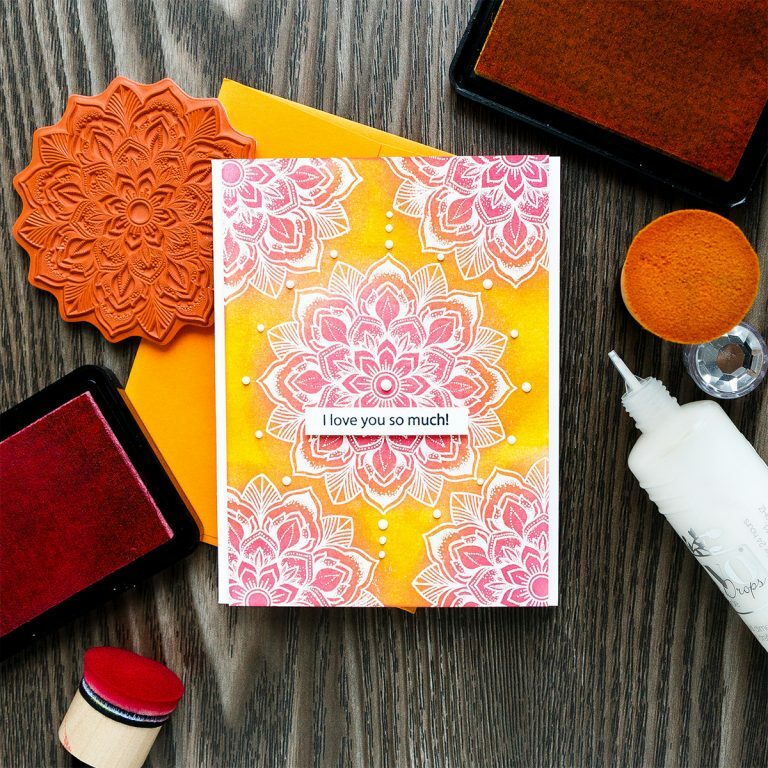 Chrysanthemum Cutie for sure! They are sooooo very fun to color too. Keeping track of each petal can be a challenge but that is half the fun. Loves Me, Loves Me Not: What little child hasn’t played this little game with petaled flowers or weeds? I sure did. Just as the other designs, I intended these daisies to be stacked and blended together to make a lovely personalized arrangement. They are so regal! Floral Love: Hearts are so classic. So universal. 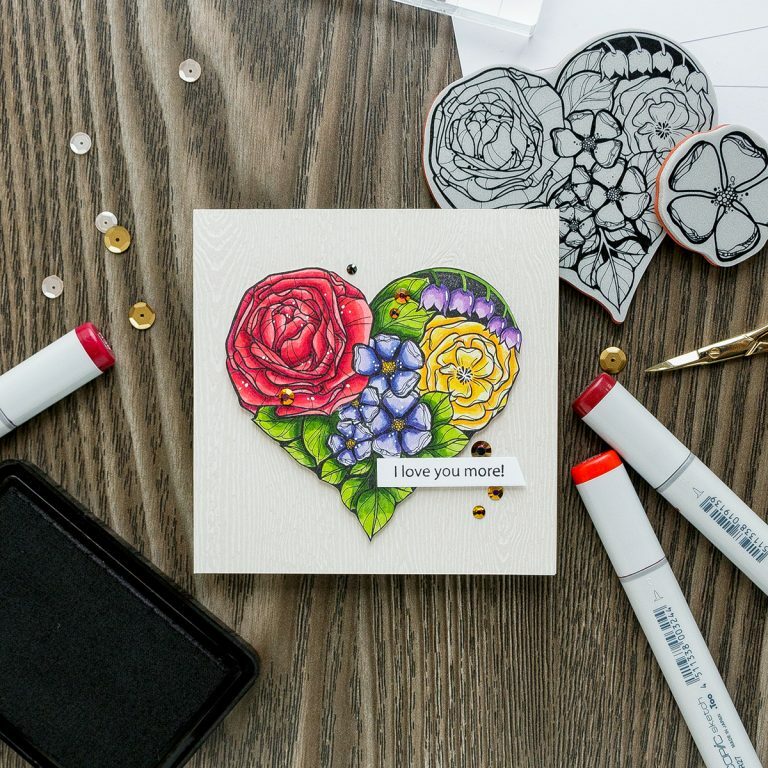 My little heart arrangement stamp is also so fun to color. 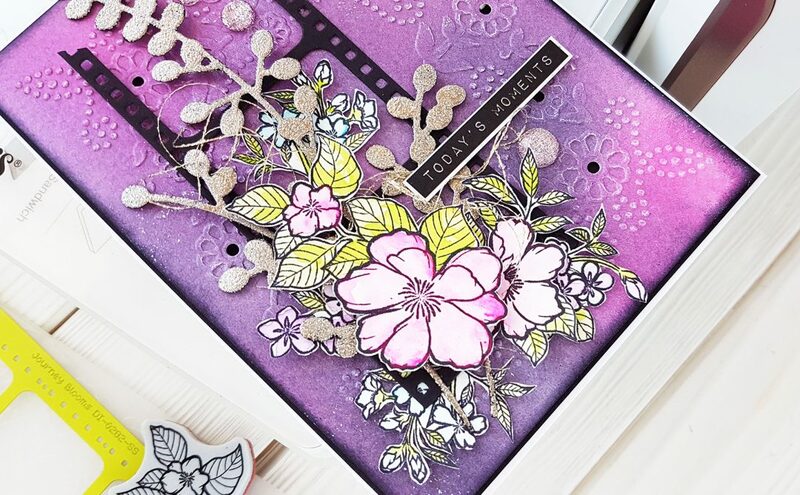 And her accompanying little blooms match with the “Little Flowers” set perfectly! Large Peonies: Similarly to the “Peonies Bundle” these Large Peonies were drawn from photographs. I didn’t want to loose the organic and natural beauty that these blooms have to offer. 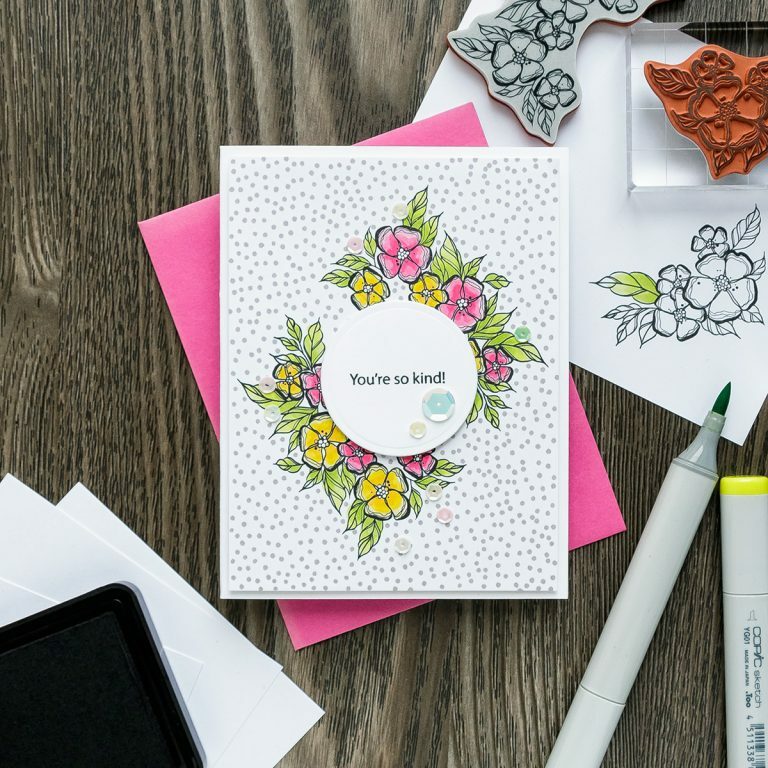 The larger blooms offer a larger space to color and make your own. Little Flowers: This is my favorite set in this collection. Which is funny because it is a small and unassuming set. I love to doodle these flowers. They are my go to flowers. I doodle them when I am on the phone. When I am writing down my to do list. I doodled them once and now they are some of my go to florals! I am so happy to share them with you. As stated before, they match perfectly with the “Floral Love” set! I hope you love this collection as I do. There are plenty of image above that I have created with tattoo customers that have a lot of love in them. Memorials of a sort. And now, as stamps, they can continue to hold meaning and love for those who receive them from those who create with them. 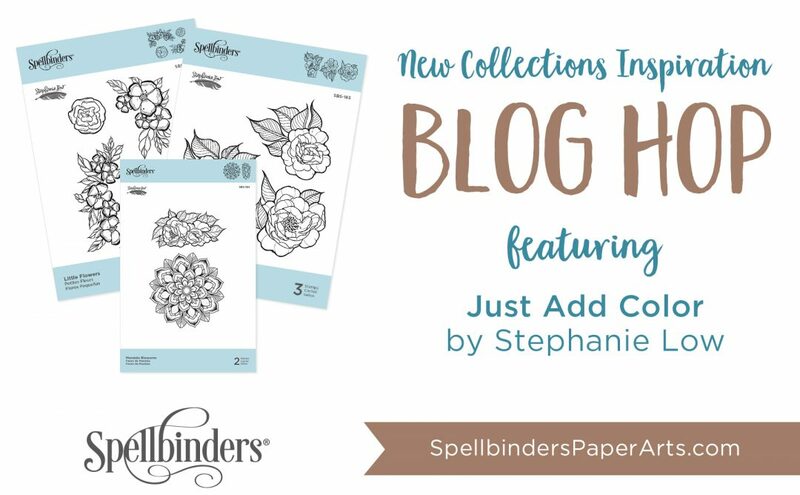 Be sure to share your coloring and arrangements with me on social media! @StephanieLowCreative on Instagram and Facebook! I can’t wait to see your lovely creations. 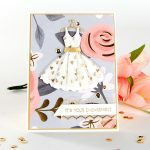 Where does one start when every card os more beautiful than the first. I love that this seems to be the year of flowers, the new releases have awesome. 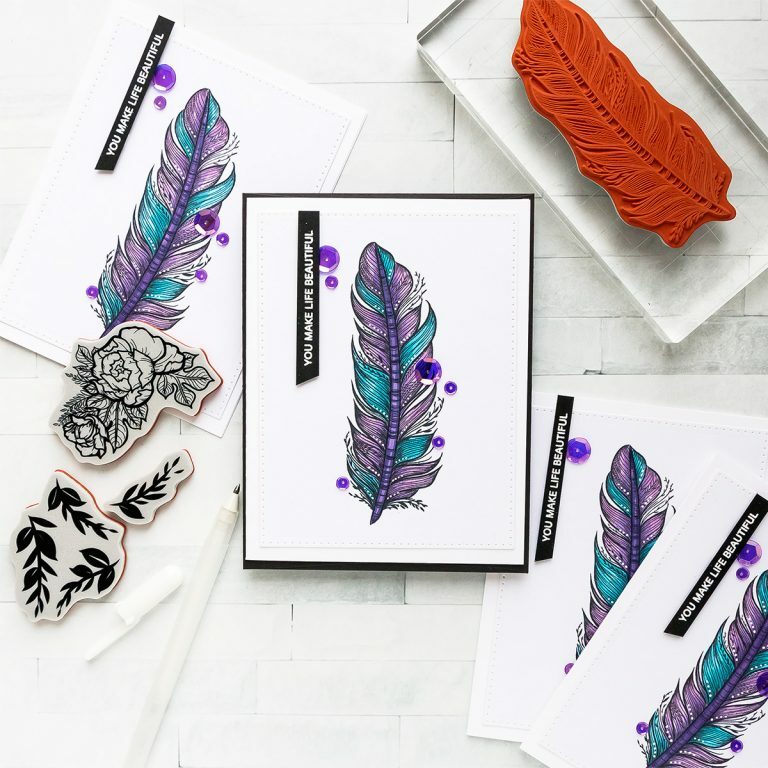 But have to say the feather is amazing and I know it will have to be in my collection soon. Thank you for sharing your talents.